He went on to explain that any doctor who joins his UIC ophthalmology department needs to understand that one night each week, he orders pizza for his team and they brainstorm into the wee hours on how to achieve his goal. Dr. Azar assumed the chairmanship of the University of Chicago Circle Campus (UIC) Department of Ophthalmology and Visual Sciences in March 2006, after a highly successful decade on the faculty at Harvard Medical School. Shortly after arriving at the UIC, he led a surgical team to anchor a plastic cornea to a hole in a donated cornea–the clear, strong surface area that allows light into the eye. This process, called keratoprosthesis, is necessary when standard cornea transplants have failed, causing the implanted cornea to become opaque or invaded by blood vessels. The very first patient, who had lost almost all vision in his left eye after an infection two years ago, found vision restored to 20/50 shortly after the surgery. But an artificial cornea is still a long way from a total eye plant. Dr. Azar’s burning mission still drives him daily. 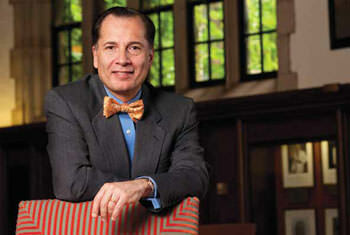 In December 16, 2011 Dr. Azar was promoted to the Dean of UIC’s College of Medicine. Despite his on-going medical practice and his business responsibilities as Dean, I’m sure that he still keeps an eye on his life goal to restore vision to those who can’t see. And because he is living his life in crescendo, I’m rooting for him to succeed. There are hundreds of people in your life who live life in crescendo. Who would you like to nominate as your favorite crescendo hero? Let me know!